Pull out your tissues — your toddler’s first steps pack a wallop. Another huge milestone that pulls on your heartstrings until you realize, Hey—he looks just like a drunken sailor. Or, in my case, Uncle Ed. Thus, it’s our duty to make sure that we find the smartest (and cutest) baby shoes to safely anchor our precious new walkers. Size does matter. Before you lunge online to order your toddler’s first shoes, start with knowing the right size. Take a trip to an actual kid’s shoe store and have your toddler’s tootsies measured by a trained specialist (or someone masquerading as one). Make sure to look out for devious curled toes that can throw off a measurement and remember to try on shoes with socks (an obvious mistake that I made). Toddler feet can also vary up to half a size, so opt for the larger foot’s size. Kids’ feet grow like weeds, so measure again in a few months. One of my favorite shoe companies, See Kai Run, also lists toddler shoe sizes by inches. Handy to know, because age and size can be a crapshoot. If you like shopping for shoes online, invest in an at-home shoe sizer, like the Squatchi. For $19, the Squatchi will prevent you from having to schlep your kids to the mall—but keep in mind that many brands don’t run true to size. Once you find a brand you love, you’ll get to know its nuances over time. Shoes for toddlers should bend easily in your hand. Be wary of plastic (or those cute, cheap sneakers from Target). Stiff is bad. The American Academy of Pediatrics recommends that toddlers wear lightweight and flexible shoes that allow their feet to move naturally. The best walking shoes for babies are made of leather or mesh material that enable feet to breathe and have rubber soles for traction. Sometimes you can find high quality, “gently-used” kids’ shoes at consignment stores and such, but generally speaking, shoes for young kids take quite a beating and tend to be “single-user” items. I’ve noticed over the years that cheaper shoes, like those from Target and Payless, have very short life spans and generally land in the trash can once they fall apart, while the higher quality shoes last much longer and may be able to be handed down to a second kiddo if s/he hasn’t already used them to death. Point being: You get what you pay for. And the same goes for the leopard-skin pointy or hipster motorcycle boots. Your shoe fetish should stay in your own closet (for now anyway). Toddler shoes are there to support and stabilize new walkers. Barefoot is best, but when outdoors — think function over fashion. Here are our favorite “first-walker” shoes, in no particular order. All of these shoes have a sturdy sole, so they can be worn outside. Note that Robeez and other soft soled shoes are cute and wonderful for indoor use, but won’t hold up in the elements. After a Seattle mom couldn’t find the best first shoe for her son, Kai, she decided to design stylish, well-made kids’ shoes that support healthy feet. Hip, adorable, and kudos for colors outside of the primary spectrum of Crayola. Sometimes I wish they came in my size. Find See Kai Run on sale at 6PM.com. Or see the complete collection at SeeKaiRun.com. Pediped was founded by a mom in 2005 who set out to make a shoe that was the “next best thing to bare feet.” Pediped now has over 120 styles of fabulous shoes, including super warm winter booties. Pediped is another mom-favorite. Find Pedipeds on sale on 6PM.com. Or see the complete collection at Pediped.com. Probably the shoes you grew up in, Stride Rite has been making quality children’s shoes since 1919, and their legacy continues. Earthy, cool, and sturdy, these are the best! And they also last forever. Find Stride Rites on sale at 6PM.com. Or see the complete collection at StrideRite.com. Although Tsukihoshi began crafting children’s shoes long before (in 1873! ), this Japanese company has been working with orthopedic professionals since 1985 to create shoes that offer the utmost protection and comfort for little feet. Tsukihoshi shoes are lightweight, machine washable (heyyyy), and anti-bacterial, and they come in great designs. Get Tsukihoshi shoes on sale at 6PM.com. Or see the complete collection here. Next are my absolute favorite little shoes: Livie & Luca. These shoes run really wide, which is why you’ll find them in my kids’ closets. Livie & Luca shoes are handmade, delightfully simple, and extremely durable. Check them out at Zappos or see what’s on sale at 6PM.com. 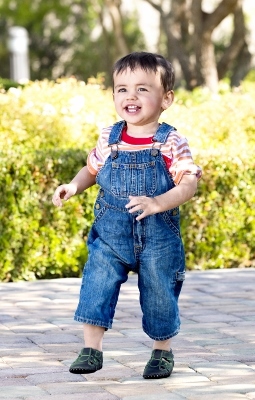 Every Step™ is a line of footwear from Carter’s designed for young children (6-18 months). They come in three stages of development: Stage 1 (crawl), Stage 2 (stand) and Stage 3 (walk). And each shoe has self-adjusting elastic and is easy to get on/off. Or see the complete Carters Every Step collection for boys and girls. Ikiki shoes are recommended by physical therapists and pediatricians because they reinforce good walking habits as they squeak when walking heel to toe. And each sole has a different color, making it easy for your kiddo to put the right shoe on the right foot. Find Ikiki shoes on sale at Amazon. Good luck on your shoe hunt!